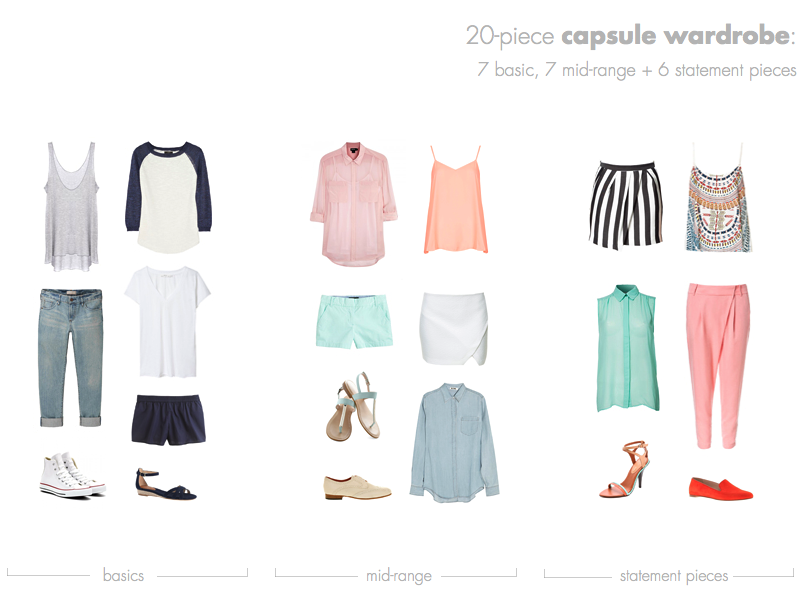 One of the top questions I get about capsule wardrobes is whether it is possible to build one without having a set uniform. The short answer is: yes it is! Even though a uniform is a great starting point, you can also build your core set of 20-30 pieces around a different structure, as long as that structure fits your unique approach to creating outfits. This post will give you a few tips on how to develop a capsule wardrobe that is tailored to the basics/statement pieces approach (check out the original Method Dressing post for a quick overview of the four main outfit-building approaches). Essentially, the basics/statement pieces approach is all about balance: you pick one or several bolder or colourful items to be the focal point of your look and pair them with a foundation of simpler, neutral pieces to create an outfit that hits the exact spot between dressed up and dressed down that you were going for. The steps outlined in Building a Capsule Wardrobe 101 are specifically tailored to the modular outfit-building approach (mixing-and-matching items that share a similar style and colour scheme and don't vary too much in how plain/bold they are), so if you use the basics/statement pieces approach most of the time you will have to tweak the method a little. Instead of organising your items as uniform and non-uniform pieces, focus on creating a balanced structure of basic, mid-range and statement pieces. When you build your outfits using the basics/statement piece approach you are already thinking in those categories, so it only makes sense to structure your wardrobe accordingly and support your creative process. So, after you have created a style concept and chosen a few item categories, estimate how many items per category you want to be relatively plain and neutral, more eye-catching or a happy medium. A happy medium? Yes, in addition to a 'basics' and a 'statement pieces' group, your wardrobe should also contain mid-range pieces that are neither plain nor super bold, to diversify your range of outfit options. Because we all have different ideas of what constitutes a 'plain' or a 'dressed-up' look, building a mid-range section will also help you make sure your wardrobe fits your own unique conception of dressed up/down. For example, the white mini skirt in the sample wardrobe above may well be a basic for some of you and a statement piece for others. Try to build your mid-range group first by selecting items that fit your style concept exactly and then use it like an anchor point to choose pieces for the other two groups: simpler and less colourful items for the basic section and bolder items for the statement section. In general you can divide your items relatively evenly across the three groups for each category: so for example if you think you need 12 tops, aim for 4 per group, although of course you can always shuffle things around in the end. An exception to the rule are item categories like shoes and outerwear in the fall/winter: To increase your wardrobe's versatility, always prioritize the basic/mid-range groups when allocating items to categories that you have to wear every single day. Of course, your choice of main items is not the only factor that influences how casual/fancy your look appears. Check out Method Dressing: Adding and Subtracting for more ideas on how to calibrate your outfits using structure, fit and make up. To what extent do you use the basics/statement pieces approach to create your looks? Here's where you can find all items:Basics - Enza Costa grey top, J.Crew baseball sweater, Uniqlo boyfriend jeans, ZARA V-neck t-shirt, J.Crew shorts, Converse sneakers, French Connection sandals. Mid-range pieces - DKNY chiffon blouse, Topshop Camisole, J.Crew chino shorts, ZARA white skirt, mind ModCloth sandals, Poste Mistress brogues, Acne denim shirt. Statement pieces - ZARA striped skirt, ZARA printed top, Vila turquoise sleeveless blouse, ZARA crossover trousers, Rebecca Minkoff high heels, J.Crew orange suede loafers.